The Deputy Mayor, Cr Milligan as Acting Chairperson opened the meeting and welcomed all present. Pastor Trevor Bartley led the meeting in prayer following a minute’s sillence for those persons recently deceased. THAT Leave of Absence be noted to have been granted to Cr Jones due to attending commitments at the Brisbane EKKA. THAT letters of condolence be forwarded to the families of the recently deceased persons in the Lockyer Valley Region. (b) leave the meeting room (including any area set aside for the public), and stay out of the meeting room while the matter is being discussed and voted on. Pursuant to Section 173 of the Local Government Act 2009,a councillor who has a real or perceived conflict of interest in a matter to be considered at a meeting of the local government, or any of its committees must inform the meeting about the councillor’s personal interest in the matter and if the councillor participates in the meeting in relation to the matter, how the councillor intends to deal with the real or perceived conflict of interest. Cr Milligan declared to have a perceived conflict of interest in Item 17.13 “Waste Contract Extension – Anuha Services and JJ Richards & Sons Pty Ltd” and (as defined in section 173 of the Local Government Act 2009) based on her involvement with Anuha Services. 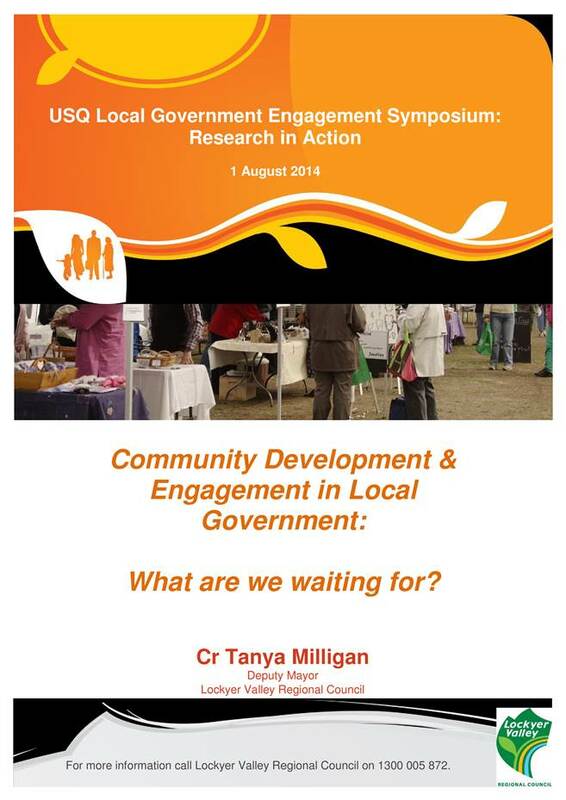 Cr Milligan made a presentation to the USQ Local Government Engagement Symposium and the presentation content is attached. THAT Council receive and thank Cr Milligan for the presentation to the USQ Local Government Engagement Symposium. Cr Milligan acknowledged the support provided by the Community Engagement Team in assisting with developing the presentation and asked that thanks be passed onto the team for their assistance. THAT the Minutes of the Ordinary Meeting held on the 23 July 2014 be hereby confirmed. 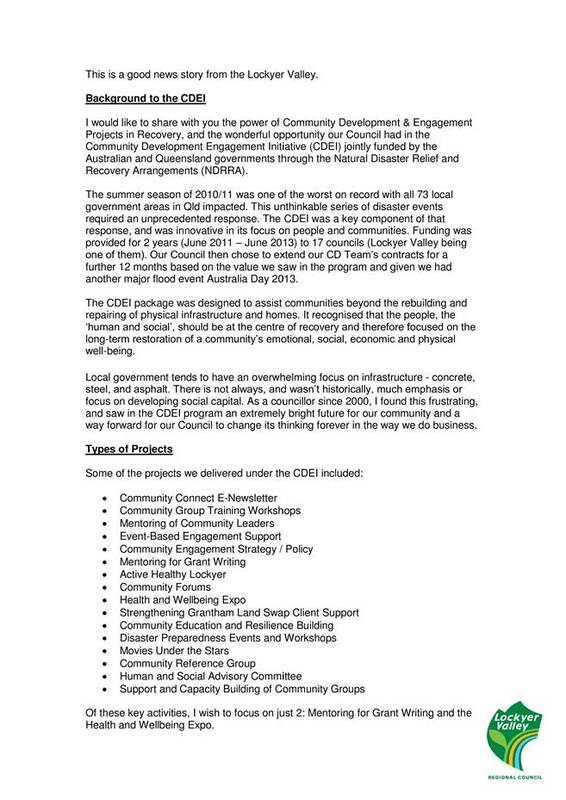 THAT the Minutes of the Lockyer Valley Local Disaster Management Group of 27 February 2014 be received and adopted. This report is to update Council on the key issues currently being actioned. THAT Council receive and note the Executive Manager Governance & Performance Monthly Update. This report provides an update on key matters arising and being addressed since the last report. The previous reports provide the background information to date and only progress is being reported for the month. A continuing focus on compliance based issues is occupying time and resources, Council received a visit from the Queensland Ombudsman’s Office, relating the current role of the Ombudsman and what support was available to Council’s and what the relationship between Council and the Office should represent. This was an opportunity to ensure that all current matters were being addressed and to receive feedback as required. This was part of broader relationship building tour in creating contacts within Councils. On a related topic Council has been engaged by the Ombudsman around Public Interest Disclosures (PIDs) and understanding the changes with the Crime and Corruption Commission and release of new standards and information requirements and reporting obligations. Council currently only undertakes minimum compliance and improvements to the policy, processes and reporting are being investigated. The Delegation Register remains a priority with process changes underway and a more simplified system being out into action for the ongoing recording of delegations. Council has been working with Southern Downs Regional Council in modelling process that fits the right approach for a Council of our size and complexity. Australian Citizenship Ceremonies continue to be well attended and a more professional process and approach is paying dividends with quality engagement and Council adding special touches to ensure the ceremony remains memorable and supports the significant achievement that citizenship represents. There continues to be a significant workload from the legacy legal issues and new matters continue to arise for risk and review to ensure an appropriate response and where needed costs associated with advice are being minimised. The Local Law Review Project Team commenced with a workshop and proceeded into an investigation and identification of all current issues that bring rise to the need for a local law or control mechanism to address ongoing issues and customer request feedback. It was determined that a stage one report will be brought back to outline the current situation and a preferred way forward. Interviewing, research and further analysis still required for stage one with the report first draft due by the end of August. This work is being undertaken in consultation with upcoming planning scheme to ensure that the correct mechanism is being used to manage compliance issues. The Council Properties Expression of Interest for the following buildings; Udy, Saddlery, Forest Hill Shops, Forest Hill Fire Station has been released and closes on 13th August, after which a full report will be provided to Council for decision. An internal audit was undertaken during the period on the IT Security Framework – Internet and email security and this report will be presented to the Audit and Risk Management Committee due to meet in late August. The Independent Chair has been engaged and will be briefed prior to the upcoming meeting. The external audit of the Financial Statements is on track to finalise timings for the Annual Report. The financial statements to June 2014 will be presented to the Committee by the 21st August. A demonstration on the proposed risk management database was received from Council’s insurers JLT through the LGM pool. Service Level Review was kick started with a presentation to ELT by Morrison Low, this review will be presented to a future workshop of Council. At present the Review process is still focussed on finalising the data around the services identified and what the priority for all services to be influenced by to determine a method for prioritising all Councils services. The Waste Mono-cell works at Helidon have been completed and the variations approved by QRA allowing the project closure to be initiated and final cash flows to be determined. The first stage of funding applications for the Australian Packaging Covenant has seen Council be successful with its submission. Council has prepared and submitted a Stage 2 funding application and a detailed project plan for the Australian Packaging Covenant – Littering and Illegal Dumping Industry and Community Partnership and is awaiting a response. A number of existing policies are due to be reviewed with these to be presented to the upcoming workshops for discussion and review. The Annual Report has been started with content writing well advanced in some sections. At this time the some of the other sections such as Community Financial Report section and the Statutory Information section have been set aside until the final financial figures are provided along with eth Financial Statements. After receiving awards in the last two years, there is growing expectation for higher orders again with this report. The Corporate Communications Team attended the official media launch of the Brisbane Ekka and produced a short clip (dvd) that highlights Council’s involvement in the launch and also in the grand parade. The Gatton History Book has finally been published and the book was launched locally in a small celebration last week attended by those who have contributed or been actively involved in its preparation over many years. The Manager Corporate Communications has recently resigned from Council to travel and pursue other opportunities and given the contribution that Sarah Fox made to Council, I would like to place on record, a sincere “thank you” to Sarah for all of her efforts in transforming our communications across the organisation. This report is to update Council on key issues currently being actioned. THAT Council receive and note the Executive Manager Organisational Development and Engagement Monthly Update. The previous reports provide the background information to date and only progress is being reported during July 2014. Late July 2014, the Modern Award preliminary draft was released by the Queensland Industrial Relations Commission’s (QIRC) Award Modernisation Team (AMOD). Councils across Queensland were asked to provide feedback on the draft to QIRC via LGAQ. This process identified that there are significant points of difference between what Local Government Councils seek from the Modern Award and the Commission’s working draft. All Unions party to this consultation process opposed the extent of AMOD’s proposed changes to the draft award and continue to pursue retention of the status quo for all award conditions. Feedback and discussion on the draft will continue at a further conference before the Commission early August 2014. At that hearing the QIRC will indicate how it will now work with parties to identify provisions in the proposal where agreement cannot be reached. They will then focus efforts on provisions where they believe a compromised agreement may be possible. From this, they will send a final exposure draft to the Full Bench of the QIRC, indicating points of agreement and points on which the Commission expects objections. The Full Bench will need to make the final decision. Based on this a full hearing may not take place until September and depending on how the process unfolds a decision may not be forthcoming this calendar year. · Leading the Leaders workshop was undertaken on 29th July 2014 and was well attended – Verbal feedback received from staff and facilitator was excellent. · Recruitment and Selection Panel Training is scheduled for August with course material relevant to Lockyer Valley Regional Council policy and procedures. · LVRC Staff Training Calendar preparation currently underway with planning and booking of courses from now until December 2015 in conjunction with Training Needs Analysis (TNA), identified within the current round of Performance Reviews. It is envisaged that this information will take corporate Learning and Developing in a clear direction for the remainder of 2014 and early 2015. · Code of Conduct training delivered to all Infrastructure Works and Services staff, Office based staff to commence training in the near future. The Wellbeing Committee continues to encourage all staff, especially those doing either the 10,000 Steps program or the 10 Week Weight Loss Challenge, to participate in the afterhours boot camps held at the Gatton University. The State Government initiate of a One Stop Shop for government services is to be presented at the next Council Workshop on 12 August 2014. The workshop will be to explore possible options as the Gatton Court house needs to be renovated and they are seeking somewhere to hold a temporary court house, noting that Council had approved for the Chief Executive Officer to open discussion with the State Government on this matter. In addition whilst the Court house is being renovated they also need a space to park a mobile van or something similar to allow public access to the One Stop Shop. The new model for Community Engagement and Development team has been established and all staff will be on board by 1 September 2014, in the interim the team including Youth, Multicultural and Settlement officers will assist in the transition. In general the Community Engagement and Development team continues to providing support to business units across Council and they are working more specifically on special projects for Infrastructure and Planning Departments. Ageo City’s sister-city relationship with the Lockyer Valley was cemented last month, when a document was signed to ensure the friendship continues to grow and flourish between the two in the future. Ageo City’s Mayor Mr Minoru Shimamura was joined by other dignitaries and Ageo school children for the visit. The Youth Council and the school children from Ageo City mixed and got to know more about each other’s culture and the greatness of diversity. Youth Councillors have been formally invited to attend the annual Brisbane Ekka Show during the month of August. Youth Councillors have been trained and will develop and share their knowledge with visitors to the show about the wonderful tourist opportunities that Lockyer Valley presents; such as the fresh produce delivery straight from Queensland farms. Youth will be able to use such skills as communication, confidence building, and public speaking, which are relevant to equip our youth for their future growth. Lockyer Valley Regional Youth Council’s workshop is due to be held on 13 August 2014, and will explore the different ways in which youth promote and recruit new members. Youth will be given a variety of mediums to produce their own promotional material, to attract the many numbers of youth around the Lockyer Regional Valley to take interest in becoming a member of the Youth Council. Council recognises and thanks MacDonald Law for over the last there and half years MacDonald Law has carried out pro bono work for our community since the 2011 event. Settlement grant funding application submitted to DSS. The Deputy Mayor was invited as a guest speaker at the USQ Local Government Engagement Symposium. The Community Engagement Team provided support to Deputy Mayor for the presentation including the development of handouts. The Community Engagement Team is facilitating the finalisation of the current model of the Community Reference Group and a thank you meeting is scheduled for Wednesday, 6 August 2014. Upcoming is the SES New Graduates presentation for the Lockyer Valley SES 2014 Recruits, which is being hosted by Lockyer Valley Regional Council on Wednesday 27 August 2014, to recognise the new recruit’s achievements in obtaining qualifications to enable them to assist the community. A further update will be provided post the event. An Expression of Interest for the provision of catering & hospitality management services at the Cultural Centre has been advertised. Dickson Wohlson Strategies, who are hospitality specialists, are acting on behalf of Council. Expressions of Interest are sought under several options that include the provision of catering services at the Staging Post Cafe on a standalone basis and the provision of catering services at the Staging Post Cafe as well as management of functions and events. Opening and closing dates for expressions of interest are from 6th August 2014 to 5th September 2014. The Deputy Mayor, raised that a number of positive comments were made by the Community Reference Group members on the thank you function, its location and organisation. The Deputy Mayor thanked all those involved with the function. The Disaster Management (Recovery & Resilience) and Community Engagement (DM(R&R)&CE) team took the opportunity to be present at the Laidley Show (5-6 July) and Gatton Show (18-19 July). Disaster Management staff conducted activities around assessing and improving disaster preparedness in the Lockyer Valley community, while Community Engagement officers took the opportunity to consult the community on the Laidley Futures Project. This report covers the activities of the DM(R&R) &CE team at both the Laidley and Gatton Shows. 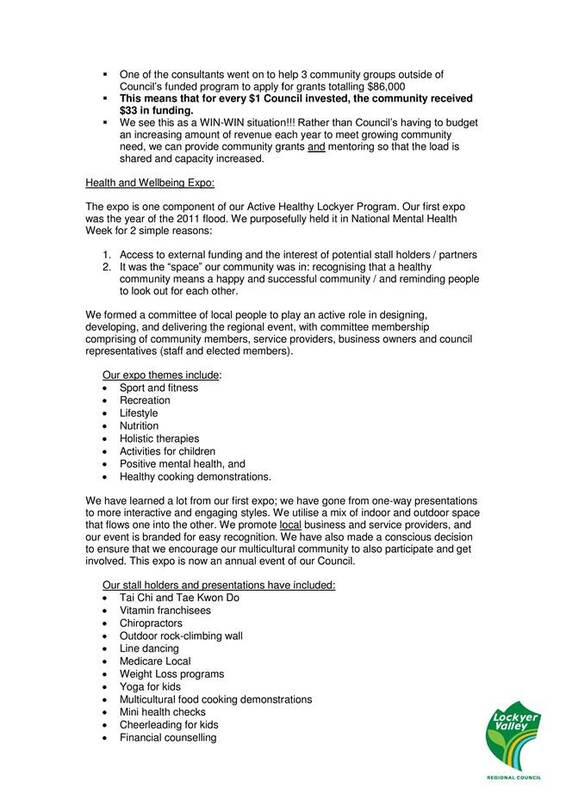 THAT Council receive and note the Gatton and Laidley Show Engagement Activities report. Council’s presence at the Laidley and Gatton Shows is long standing and a valuable platform to engage, inform and educate the community. The DM(R&R)&CE team took the opportunity provided to all teams across Council to participate in both local shows. This report will summarise the activities at these shows of the DM(R&R)&CE team. The Community Engagement team were only present at the Laidley Show and used the opportunity to consult the community around the Laidley Futures – Arts & Cultural Integration project. This project was initiated by the Laidley Futures Project Team to further the aims and objectives of the Project and to increase the inclusion of arts and cultural components in the revitalisation of Laidley main street and surrounds. Disaster Management (DM) and Community Engagement (CE) officers attended the Laidley Show on Saturday 5 and Sunday 6 July as part of a larger Council presence over two sites. DM Officers manned the Mobile Education and Resource Centre (MERC) Van at an outdoor site while CE Officers were present at the combined internal site. Youth Council members were successfully utilised to attract families through the use of the children’s game. Children were asked to spin a multi-coloured wheel and answer a question from corresponding coloured cards. These questions were around disaster preparedness, emergency kit items and emergency scenarios. While children were involved in the game, an officer invited parents to enter the Home Emergency Starter Kit competition and engaged them in conversation around the family disaster plan, emergency kits and general preparedness. Details of this conversation were later documented on Disaster Resilience Survey sheets. The “My Valley, My View” mapping exercise was another successful engagement tool with residents asked to identify issues or give feedback on the region. This information has been documented and all relevant customer requests generated. At the indoor stall CE Officers engaged with both residents and visitors around the Laidley Futures – Arts & Cultural Integration project. Participants were invited to view thirty picture cards of various art and cultural installations and to select their top five preferences. They were then asked to talk about what they particularly liked about the pieces. Further questions were asked to explore and clarify the key (positive) images and words people associated with Laidley, the historical sites, events and people they would like to see presented on storyboards, and demographic information to assist with validating sampling and weighting. The process was designed for in-depth discussion for qualitative responses rather than a high-speed tick-box survey which would lack the context required for effective future analysis and implementation. Another CE officer engaged with residents who had been working with Council in regard to Laidley flood mitigation projects. Residents made the most of the opportunity to ask questions on the projects progress. The game was a very effective tool to draw children to the stall with a total of ninety-two being engaged during the two day period. It was interesting to note the high knowledge level of children of upper primary school age (10-12 year olds). Questions asked of the children prompted conversations between family members. Additional questions then logically followed e.g. “Do you know the number for the SES?” led to questions such as “Why do you call SES?” and “When would you use 000”. A number of parents were prompted by their children to develop household plans. Further development of the question cards will follow to address other key preparedness knowledge areas. While children were engaged with the game, parents were invited to enter the Home Emergency Starter Kit Competition. Eighty-eight entries were placed in the draw with 41% of entries coming from people outside the region. Entry in the competition gave an opportunity for DM officers to discuss the need for emergency preparation. This resulted in quality conversations around contents of the home emergency kit and the need for a household emergency plan. Discussions with fourteen Lockyer Valley residents who visited to the MERC Van site yielded answers to a series of questions to ascertain their level of preparedness and resilience. The majority of visitors were from the Laidley area and were in the 21-40 age bracket. While this number of participants does not give a high degree of accuracy to the information gathered it is interesting to note that 71% of these residents had discussed emergency planning. Of most concern, are the 15% of residents who do not know other members of the community and have not built any connections within their community. The interactive mapping exercise was undertaken to assess current community issues and was also a tool to assess community resilience and build resilience through education. Any customer requests and issues raised outside DM were forwarded to the appropriate department. Only sixteen people participated in the consultation process; this sample size is insufficient to draw any valid conclusions. Of the thirty pictures provided, four were chosen as “top 5” on at least 35.3% of occasions and another three were chosen on 29.4% of occasions. Though these four pictures represent a significant variance in styles, mediums, likely placement, levels of colour and vibrancy, one consistent commonality is that they were all perceived as “interactive”. Generally, “abstract” pictures scored low with one notable exception where the piece was also “interactive”. In terms of the dominant icons/images respondents associated with Laidley township, nothing scored more than 18.8% (“the main street”), although by grouping into themes both “heritage” and “agriculture” were very significantly selected. When asked about the words that best captured or described the “spirit of Laidley”, “village theme” and “a sense of community” scored greater than 37.5% each and more than 80% combined. DM officers attended the Gatton Show on Friday 18 and Saturday 19 July as part of a larger Council presence at a single U-shaped 9m x 3m site inside the Sports Centre. Due to the size of the site and the limited space allocated to Disaster Management, the area was too small for all activities to be run concurrently. This resulted in opportunities being lost. Set up was based on space available rather than on space needed for messaging and activities to be delivered. The children’s game was again very successful by engaging with 353 children over the 2 days. Again it was interesting to note questions asked of the children prompted conversations between family members and prompted parents to identify the need to develop household plans. Of the 353 children engaged with, 83 were part of 5 large school/child care centre groups. During these interactions staff also engaged with teachers regarding disaster management education resources. The competition was entered by 73 participants with 75% of participants residing in the Lockyer Valley. The competition provided the opportunity to engage with residents to discuss the need for a home emergency kit. During entry in the competition staff engaged in conversation around emergency planning. The Disaster Resilience Survey was discussed with 41 show goers with 85% residing in Lockyer Valley. Only 42.5% of respondents had discussed emergency planning but 72% of have a built good relationships within their community. The interactive mapping exercise was not successful at the Gatton Show given the restricted space and limited time to spend with individuals. The maps were generally used to identify rabbit sighting sites. There are no known policy or legal implications. All costs were met within existing budgets with little expenditure expected outside of employment costs. The matters arising from this report that require further communication will be addressed through existing communication channels. That Council review and accept the Disaster Management (Recovery & Resilience) & Community Engagement – Laidley & Gatton Show Engagement Activities update. This report provides Council with a brief summary of key operational activities undertaken by Corporate and Community Services during July 2014. THAT Council receive and note the Executive Manager Corporate & Community Services Monthly Update. THAT Council forward a letter of congratulations to the children and staff of the Gatton Childcare Centre, Kindergarten Room acknowledging their First Prize and Best in Show display at the 2014 Gatton Show “Year of the Family Farmer”. Council should be aware of group activities to guide future decision making. A brief summary of the key outcomes of Corporate and Community Services during July 2014 by functional grouping follows. This section of the report breaks down activity within the Customer Services Branch by service type. During July, 3,647 service requests were processed with 1,623 of these requests resolved at the first point of contact. There were also 427 eRequests generated as a result of incoming mail and emails for the month. The following two graphs show a recent history of total service requests and July 2014 service requests by function or activity. As expected at this time in the rating cycle, rates issues continue to account for over 35% of all service requests raised. The following graph shows the July 2014 service requests by group with Corporate and Community Services accounting for 70% of all service requests raised followed by Planning and Development with 19%. · service requests remaining open at 31 July 2014. There were 33 new councillor requests in July 2014 with 12 of these remaining open at 31 July 2014. 3,743 telephone calls attempted to connect with Council’s telephone exchange in July 2014. During the month the maximum queued contact was 8 with the average wait time to be answered being 1 minute 10 seconds. During the month, Council’s service level dropped slightly to 83.7% against a target of 80% due to an increase in calls for Animal Registration Renewals. Recent trends are shown in the following graph. Call back introduced during the last week in February had 30 calls logged in July 2014. During July, 670 calls were transferred within the organisation. This includes those calls which were transferred directly when a named caller was asked for and all other calls that are transferred as part of the call process. 130 live chats were performed during July which is considerably higher than last month. Feedback continues to be excellent for users of the system. There were 1154 QGAP transactions processed by Council during July 2014. Major achievements during the month by project follow. Stage 3 (completing the painting of the external walls of the main building, not including the Squash court area) and the air conditioning of the function room have now been completed. Laidley CCTV cameras are now fully installed and operational. Fine tuning camera angles is now underway to address recognised ‘blind spots’ along Patrick Street, Laidley. Signage stating that the area is under CCTV coverage has been ordered and will be installed in the near future. The ablutions block project has experienced some delays through the building approval process as plans were changed to meet disabled requirements. Approval has subsequently been received and footings installed on site. The building will be delivered to site on Tuesday 5 August with concrete pathways to then be installed. This work should be completed by the end of August 2014. Council officers have also meet with representatives of the Men’s shed in relation to siting clean fill from the Regional Aquatic Centre project to allow for the creation of a new flat pad area on site. The fill arrived and was spread across the site on 8 July. Arrangements have been also made with the Regional Aquatic Centre contractor to provide additional fill at a future date to be confirmed. The Gatton Administration Alterations and Refurbishment project (new lift and entry statements) has been substantially completed. However, Practical Completion has not been granted as there are still some on compliance issues to be resolved. Work is now progressing of the refurbishment of general office space. The Contract for Laidley Sports Clubhouse project is progressing well. The grandstand and toilet block have been demolished without incident and work is progressing to schedule. The expected completion date is December 2014. The 12m x 6m donga from the Grantham Estate has been repositioned on the AFL oval at Cahill Park. The building steps and small landing have now been reattached with tie down footings completed. We are now obtaining quotes for the installation of power and water to the building. This project whilst approximately 5 weeks behind schedule remains on track for completion by the end of October 2014. The heaters from the existing pool are due to be removed on 22 September 2014 to align with the works schedule. This effectively means that with the exception of the University of Queensland pool, the region will be without a heated pool for the last 2 weeks of September and October 2014. The official opening of the Regional Aquatic Centre is scheduled for 6 December 2014. The Cultural, Health & Regulatory Services Branch hosted the Environmental Health Australia Darling Downs and South West Regional Group meeting on Friday 18 July 2014 with 42 delegates in attendance. Animal Management continues to receive a large number of Customer Requests. During July, Lockyer Valley Libraries utilised the new Council technologies, the GoTo Meetings and the Mondo pads, for the regular combined staff meetings of the Gatton and Laidley branches with officers able to share information and discuss matters via this video link. This technology was also recently used for a successful workshop demonstration of preservation techniques given by officers from the State Library’s Preservation Unit to Council officers and Library customers. During July discussions were also held with relevant Council officers and representatives from architects, Fulton Trotter on the redesign of the Laidley Library. At the Art Gallery, the new exhibition of vintage clothing featuring clothing from the 1950’s to the 1980’s has received good feedback with the exhibition available for viewing until 17 August 2014. In relation to Child Care, the kindergarten children entered a display in schoolwork section of the Gatton Show “Year of the Family Farmer” and won First Prize and Best in Show. The Gatton Childcare Centre promoted diabetes Week with a pyjama party on 16 July and Kensington Grove had a pyjama party on 17 July. Grandparent’s morning was held at the Gatton Childcare Centre on 23 July and Kensington Grove on 24 July. An internal audit was conducted on our information systems focusing on security and control mechanisms. A full report including recommendations on corrective actions will be presented at the next Internal Audit Committee Meeting. The new Fuji-Xerox Printer Devices are currently being rolled out across Council with all devices expected to be deployed by the end of August 2014. Testing in One Council has been successful with the rates amount levied matching the amount budgeted plus an increase of $70k for natural growth. The target date for the rate issue is 8 August 2014. Council’s borrowings application is due by 30 September for priority review, however due to the planned QTC Credit Review, our application will not be assessed until the review is completed. The process can be expedited if required for cash flow purposes. End of year adjustments are still being completed and the final figures prepared. Accrual adjustments are now being finalised. The draft interim management report has been received with no high risk issues identified. The audit is on track for completion in September. With the removal of the Carbon Tax, Council is seeking to ascertain what refund is applicable for waste sent to Ti-tree Landfill for disposal (via JJ Richards) from the period of introduction to the current period. The purpose of this report is to seek Council’s position on the future provision of Community Housing in the region, in line with the introduction of the National Regulatory System for Community Housing. THAT Council advise the Department of Housing that it intends to end the funding relationship with the Department and transfer community housing assets back to the Department. The National Regulatory System for Community Housing (NRSCH) commenced in Queensland on 1 January 2014. The new Legislation impacts on how Council manages the provision of its community housing at Cochrane Street, Gatton and Clarkes Lane, Gatton. Council currently provides twelve long term low cost housing units for aged persons. The units were constructed on Reserve land with joint funding from Council and the Department of Housing. Council currently sets the rental amount charged for the units being $120 per week for single persons and $180 per week for couples. Currently, the tenant waiting list is managed by the Department of Housing in Ipswich; however, the selection of tenants is undertaken by Council. Council is also responsible for the ongoing upgrades to and maintenance of the units. In January 2014, the Housing and Other Legislation Amendment Act 2013 was adopted as an amendment to the Housing Act 2003. The amended Act does a number of things, including facilitating the implementation of the National Regulatory System for Community Housing Providers (NRSCH) and setting the foundation for a different relationship between the department and its housing service partners. The National Regulatory Code sets out the performance outcomes and requirements that must be met by registered community housing providers under the NRSCH. Community housing providers must demonstrate their capacity to comply with the Code on application and once registered, must demonstrate ongoing compliance with the Code. It should also be noted that under the new regulations, Council is no longer in a position to determine the amount of rent to be charged. As a current housing provider, Council now has the following four options to consider in relation to community housing. Council may obtain registration under the NRSCH and thereby continue a funding relationship with the State beyond June 2015. Under this option, Council would continue to provide community housing and will need to maintain full compliance with the new regulations, including the increase of rent set by the Department of Housing’s Electronic Rent Calculation Tool. Council may decide that it is preferable for its community housing assets to be managed by another provider that is planning to attain, or that has already attained registration under the NRSCH. Council would be responsible for sourcing an alternate provider and entering into an agreement with the provider to transfer the assets. Council will also need to arrange for current valuations to be carried out on all properties. Council may choose to end the funding relationship with the Department of Housing through the return or transfer of community housing assets to the Department. Council would no longer be involved in the delivery of community housing and would no longer have to maintain the assets. However, it should be noted that under this option, any equity held by Council in the property will not be returned upon transfer or return. The funding agreements provide a mechanism to calculate the contingent liability payable to the Department should Council wish to sell the property, use the property for a different purpose or simply have the Department release its interest in the property. To exercise this option Council would need to undertake valuations of all properties showing a separate value for land and improvements and forward these to the Department requesting a final payout figure. Council would also need to purchase the Reserve Land on which the properties are built. Policy and legal implications will need to be addressed once Council has made a decision on its preferred option. Council must either register to continue providing housing by 31 December 2014 or end its funding relationship with the Department by 30 June 2015 to avoid being in breach of funding agreements. Traditionally, the community housing program is operated at a loss to Council of approximately $50,000 per year due to cost of ongoing maintenance of the units outweighing the revenue received through rent. No further delegations are required to manage the issues raised in this report. The Executive Manager Corporate and Community Services will manage the requirements in line with existing delegations. Council will need to ensure that all tenants are made aware of its intentions regarding the future of the community housing program. Other matters arising from this report that require further communication will be addressed through existing communication channels. 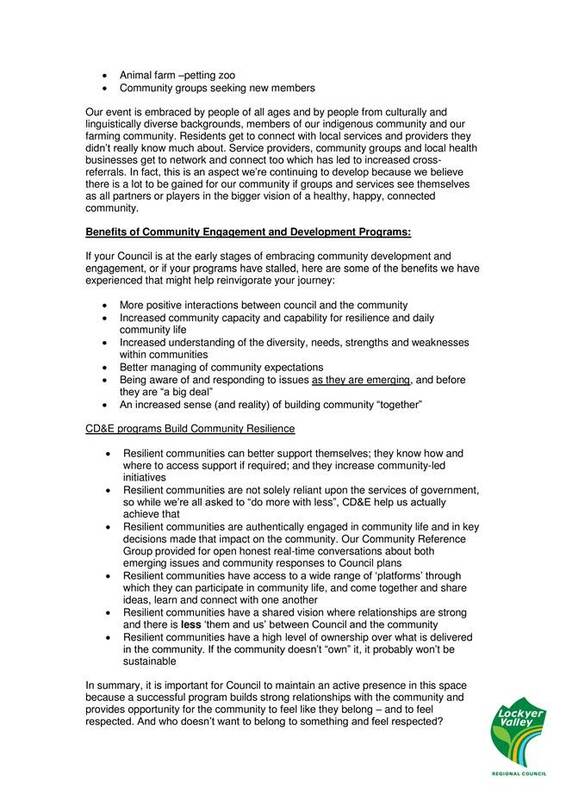 As community housing is not a core function of Council and the program within Council runs at a loss due to subsidised rents, it is recommended that Council transition out of its community housing program. Council to advise the Department of Housing of its decision and put processes into place to either register under the NRSCH to continue to provide community housing or to begin the transition out of the program and undertake the transfer of associated assets. The report provides Council with an update on the current process for the management of barking dog complaints and recommendations for improvements to the process. THAT Council endorse the purchase of barking dog collars for hire to owners of animals in order to assist in the control of barking dogs. THAT Council endorse the purchase of anti-barking dog collars for hire to owners of animals in order to assist in the control of barking dogs. THAT Council resolve to amend the 2014/15 Fees and Charges “Cost Recovery” Hire of Dog Anti Barking Collars, to include a bond of $20 with a hire fee of $20 for a two week period with a maximum period of 4 weeks. THAT a report be presented to a future meeting of Council within 3 months on the effectiveness of the anti-barking collars initiative. Council’s Local Law No 2 (Animal Management) 2011 Schedule 4 states that a person who keeps an animal on premises must take all reasonable steps to prevent the animal from making a noise or disturbance that causes a nuisance or disturbance to the occupiers of premises in the vicinity of the land on which the animal is ordinarily kept. Council is responsible for the management of the Local Laws and investigates numerous complaints throughout the year regarding nuisance from barking dogs. An Animal Nuisance Complaint Process is followed and this process has been generally successful for the control of nuisance from barking dogs. The Local Laws adopted by Council in December 2011 were developed under the Local Government Act 2009 (the Act) and provide the legal and procedural framework for the administration, implementation and enforcement of Local Laws. The Act empowers Council to make local laws that are suitable to its particular needs and resources, and that achieve the purpose and principles of Council. Section 28 of the Act provides the power for local governments to make and enforce local laws that are necessary or convenient for the good rule and government and suitable to their particular needs and resources of their local government area. The Local Law No 2 (Animal Management) 2011 provides the minimum standards for keeping animals, controlling stray animals, circumstances in which animals are prohibited, circumstance in which keeping animals require approval and the provision of impounding procedures followed by Council. The process regarding a noise nuisance complaint involves three (3) stages where both the complainant and the dog owner are sent a noise complaint package. The package details the process that Council will follow and states to the owner that should further investigation of the complaint be substantiated, Council may issue a Nuisance Abatement Notice. If the notice is not complied with within a reasonable timeframe, Council will then consider issuing an Infringement Notice and/or Notice to remove the animal. The complainant is advised to allow a minimum of five days after receiving the letter to allow for the animal owner to take reasonable steps to minimise the alleged noise nuisance. If the nuisance still exists then they can complete a noise nuisance diary to assist in any subsequent investigation. If the investigation confirms non-compliance, then an Abatement Notice is issued to the animal owner. Following further noise complaints Council may issue an ‘Infringement Notice’ (currently $550 fine) and may also consider also issuing a ‘Removal of Animal Notice’ to remove the animal from the property. During the process Council Officers provide advice to dog owners regarding the control of nuisance animals, including the reasons for dogs barking excessively and techniques on how to prevent this behavior. The use of approved barking dog collars is considered to be a helpful tool and a benefit in the control of excessive barking by dogs. Generally they work by the barking initiating a spray of citronella. Barking dog collars are available commercially and are approximately $100 each to purchase. The collars have proven to be effective in the control of dog barking, it is proposed to incorporate the purchase and hire of barking dog collars into Council’s existing processes. Any budget implications will be addressed through existing allocations. No further delegations are required to manage the issues raised in this report. The Executive Manager Corporate and Community Services will manage any requirements in line with existing delegations. The matters arising from this report will require communication to the community of and will be addressed through existing communication channels. Council is requested to note the contents of the report, and to approve the purchase 10 barking dog collars that will be available for hire to the public. This strategy will also assist in the reduction of noise nuisance in the community in relation to barking dogs. Council staff will continue to manage the animal noise nuisance complaint process and investigate all barking dog complaints as required. The proposed animal nuisance complaint process is to be advertised through existing communication channels. This report is to update Council on the big issues currently being actioned within the Planning and Development Services Group. THAT Council receive and note the Executive Manager Planning and Development Services Monthly Update. The previous report provides the background information to date and only progress is being reported during July 2014. · Gaining accreditation with the Australian Institute of Building Surveyors (Level 3). With this qualification/licence Zac now has the ability to issue Development Permits for Building Work for Class 1 & 10 buildings & structures up to 500m2 (most residential development) and carry out all relevant inspections associated with the approvals. New dwelling applications average 18 per month, past quarter 64 applications indicating 19% above previous quarter. Total value of construction work in LVRC region for January to March 2014 quarter was about $16,875,000.00. From April to June 2014 quarter value of construction work in LVRC region was approximately $19,367,393.00 also indicating a 19% increase. The information request by the State has necessitated the preparation of lengthy additional assessments contributing to the time to prepare the additional information. In responding to date an additional 1350 reportable items have been requested in 18 separate reports assessing the scheme against the South East Queensland Regional Plan. The team has largely completed this additional package of work evaluating those elements of the draft Lockyer Valley Planning Scheme which are considered to be inconsistent with the South East Queensland Regional Plan by the State. The preparation and provision of this additional information to DSDIP is not included within the performance timeline set out in the State Government guideline for completing the State interest review and so impacts on the timeframe for receipt of the Minister’s approval to commence community consultation on the draft planning scheme. The comprehensiveness and quality this information is critical to defend the inclusion of elements of the draft planning scheme that are not currently supported by DSDIP. Without this work the provisions that will allow consolidation of rural residential areas would have been rejected by DSDIP. This work included preparing a detailed 75 point response for 18 areas across the Lockyer Valley which equates to 1 350 separate pieces of information. The material that is to be used during public consultation on the draft Lockyer Valley Planning Scheme was finalised with a short one page information flyer to raise community awareness of the upcoming consultation on the new planning scheme was provided at the Council stand at both the Laidley and Gatton Shows. · Permit paddle craft on the Lake - Planning and scoping works will be progressed as a priority with works to be scheduled to commence when funding is available. · Permit fishing on the Lake - This will be delivered as part of the establishment of the launch point. · Enhance access for bird watchers at the Lake - Planning and scoping work will commence as a priority. · Improve signage at recreation area - It is anticipated this will be implemented by September 2014. · Establish walking trail adjacent to dam wall - Planning and scoping of works will be progressed as a priority. · Permit swimming at Lake Dyer - It is anticipated this will be implemented by August 2014. A meeting was held on 16 July to determine the site at Lake Dyer that will be recommended to Council as the designated swimming area as per our submission earlier in the year. A representative from SEQ Water will provide a full recommendation and has committed to presenting at Councillor workshop prior to proceeding. Herb and Donna Dunn also provided guidance on the most suitable area. Expressions of interest letters have been sent out to selected food operators within the Lockyer Valley to sell their produce in display cabinets at the Lake Apex Visitor Information Centre. As part of Council’s participation at this year’s Laidley Show, a new project approach was taken which included multiple teams across Council over two sites. There was an inside and an outside stall which included staff from Libraries, Waste, Corporate Communications, Disaster Management, Youth Council, Regional Development and Community Engagement. The benefits of a combined stand were highlighted when residents had questions around various Council projects and provided an opportunity to showcase to our rate base what we deliver. At the outside stall with the MERC van, the use of a children’s game to attract young families was very successful. The “My Valley, My View” mapping exercise was another great tool for engagement and some good feedback was received. New business registrations for the region have been received for the final quarter of the financial year; the registrations have dipped from the highs of the previous quarter and returned to historical levels. There were 135 new business registrations during the period April to June 2014, these were across all sectors with the highest representation in Administrative and Support Services, Construction, Agriculture Forestry and Fishing and Professional Scientific and Technical. During the 2013/14 financial year there were 724 new business registrations and 409 cancelations, which is a net increase of 315 businesses to the region. Council representative attended the Lockyer Better Business monthly committee meeting where current initiatives of the chamber were discussed. The chamber is offering a “bring a friend discount” for the next breakfast to encourage greater attendance at the networking events during winter. The group were provided information on the key dates for the Lockyer Valley Business Training and Apprenticeship Awards. The winners of the Lockyer Valley 2014 Caravan and Camping Show competition have received a formal letter of notification of their success. The congratulatory letters were sent with associated vouchers. Two out of the three winners coincidentally live in the Lockyer Valley. A launch was held on 15 July at 10am at the Lockyer Valley Cultural Centre with approximately 40 invited guests and Councillors attending. It was a good opportunity for some key locals, Councillors and others involved in restoring the truck to view it as a finished product before it is part of the main Ekka launch. A representative from the RACQ was at the launch as well as the family that donated the truck from Oakey. Win News covered the launch and there was a great story that went to air on Tuesday night. The Gatton Star also attended and it is expected a story will be printed in the coming weeks. Council’s Corporate Communications team took still photos and video footage for future use and will also forward photos onto the Chronicle Newspaper. The Lockyer Valley Community Activities Shed was heavily involved in the project, building the timber boxes and crates as well as restoring the back of the truck tray. They were very helpful in ensuring the project was finished on time and even helped us to source some veggies to display. The depot staff also worked very hard and after hours to have the truck mechanically finished on time and arranged transport to the cultural centre where the Regional Development team prepared the exhibit with theming and product for the launch. The launch generated keen interest by the community and media and provides a platform for further opportunities for Council to utilise in other campaigns. The RNA EKKA launch took place on 17 July. Council’s Fruiterer’s Truck was the central focus of the combined display for the Lockyer Valley, Scenic Rim and Southern Downs regions in the Regional Harvest promotion. Bags were also put together for the media promoting each of the regions and also included some product samples from key food producers in each of the regions. A media release was prepared by Corporate Communications and distributed to all media channels outlining how the Lockyer Valley Regional Council has led the way in promoting our region as Australia’s leading food region and through this campaign have supported our neighbouring regions to feature some of their food products. All three Mayors from the regions were invited to the launch to meet the media and promote the campaign. One outcome from the launch already has been an offer for the Fruiterer’s Truck to participate in the EKKA Grand Parade on Peoples Day where we will have the opportunity to promote the Council initiative with the truck restoration and the significance these vehicles have had in rural lifestyles. The Gatton Library is aiming to run book conservation tutorials in small groups or individually, in conjunction with the State Library Queensland using the Mondopad and GoToMeeting system. This will give library customers the opportunity to either come into the Gatton Library to participate, or access the online meeting from home. Through this technology conservators are able to consult face-to-face and demonstrate preservation techniques. The classes will be free and will dramatically cut down the time and costs for customers and the library usually associated with attending workshops in Brisbane. The Gatton Library had their first test run with one customer and had an online meeting with six participants from the State Library in Brisbane. The specialists were able to demonstrate and explain techniques to the customer and show several examples of conservation procedures online. The State Library has confirmed the Mondopads and GotoMeeting are sufficient to conduct a professional assessment and provide professional advice to customers. The Gatton Library is planning to advertise and promote workshops towards the end of 2014. During June Council’s destination Instagram account has been active with 13 posts uploaded during the month, and a 12% increase in followers to the account. There has also been a 50% increase in posts from the generally community using the “Lockyer Valley” hash tag, this greatly increases the number and quality of images that can be reposted to promote the Lockyer Valley. During the month there has been many stunning sunset photos taken in the Lockyer uploaded as well as images depicting Powerfest, the Caravan and Camping Show and Queensland Week. This year’s Council participation at the Gatton Show delivered a single internal site with representation from multiple teams across Council. Darling Downs-Moreton Rabbit Board and Biosecurity Queensland were also represented on site. Disaster Management, Youth Council, Darling Downs-Moreton Rabbit Board and the live Fire Ants from Biosecurity were the biggest draw cards to the Council stand with use of interactive displays which led to engagement on different Council matters. Regional Flavours took place on 19 and 20 July at South Bank, running from 10.00am-5.00pm daily. Council again this year had a substantial presence at the event including a tourism stand and fruiterer’s truck from which fresh vegetables were sold. Producers attending included: Seatonfire, Schulte's, Dunlops Apiaries, DADZ Farm, Bauer's Organic Farm and Emmos. The Lockyer Valley Cultural Centre also had a stand from which samples were cooked up as well cooking demonstrations and promotion about the facility. The fruiterer’s truck was a hit, with many people stopping and commenting on the truck or even taking photos which work well as and engagement tool. Whilst feedback from producers is still being gathered all comments were very positive and food producers had made significant sales. In addition, about 1000 guides were distributed to the public with over 500 entries in our master class at Schulte's competition. Sales of fresh produce were slower than expected, with there being greater demand for show bags as provided in 2013. Following Regional Flavours the remaining vegetable packs which had not been sold were distributed free-of-charge as a media promotion on 24th July at Reddacliff Place next to the Brisbane City Council offices in Brisbane. The space was secured free of charge (typically $2700) and coverage through Brisbane Marketing’s networks and other media. Veggies were distributed to Brisbane office workers and shoppers along with a Tourism Guide to raise awareness of Lockyer Valley products and as a destination. Media coverage of the event was good with 612 ABC crossing to Brisbane and Toowoomba with three mentions throughout the day by the announcer. Council veggie giveaway was featured on the Visit Brisbane website, Visit Brisbane Facebook page and the Courier Mail events listing in the “What’s On” section. During the giveaway over 600 Lockyer Valley Destination Guides were distributed in the four hours onsite. A meeting was attended on 24 July by Clr Holstein, Executive Manager Planning and Development Services and Manager Regional Development along with Mayor’s from Somerset and Scenic Rim, and invited guests from our three regions (approximately 60 attendees). The session was facilitated by The Department of State Development, Infrastructure and Planning which included an overview of the State performance to date in priority commitments while identifying projects of regional significance. They were also seeking feedback on key priority projects that could assist in aligning and meeting the Queensland Plan targets. The Acting Manager Planning and Environment attended a gathering of local residents in the Council parkland opposite the Amaroo Retirement Village in Railway Street, Gatton on 26 July 2014. The gathering comprised about 20 local residents who expressed concerns with the amenity impacts of the flying fox roost and requested Council take action to remove the roost. The Acting Manager took the opportunity to outline to the gathering the preliminary work that has already been completed by Council in order to undertake vegetation removal. Twenty-one volunteers took part in the annual National Tree Day event that was held in the Lake Apex Parklands on 27 July 2014. Healthy Waterways has invited Lockyer Valley Regional Council (LVRC) to host the 2014 western Healthy Waterways Report Card launch from 11.30-12.30pm on 22 October 2014. The Report Card launch is a high profile media event held simultaneously in four locations representing central, northern, western and southern areas of south east Queensland. The event would provide media opportunities for LVRC, and as a host organisation LVRC would provide one of the four images for the cover of the 2014 Report Card. Healthy Waterways would provide $1,000 towards the cost of venue hire and catering, therefore there would be no cost to council. It is recommended that council approve Healthy Waterways’ request to host the event. Healthy Waterways has also invited Mayor Steve Jones to speak at the 2014 Report Card launch. The launch coincides with the council meeting on 22 October, however as this is a valuable media opportunity we would propose that council considers positioning the break of the council meeting to coincide with the launch, to enable the Mayor to speak and councillors to attend the launch. THAT with respect to the correspondence received from Healthy Waterways offering LVRC the opportunity to host the Western Healthy Waterways Report Card launch from 11.30-12.30pm on Wednesday 22 October 2014, Council approves the request to host the launch. Healthy Waterways has invited LVRC to host the western Healthy Waterways Report Card launch on Wednesday 22 October 2014. • agree to positioning the break of the council meeting to coincide with the launch, so that the Mayor can speak at the launch and the councillors can attend the launch. Healthy Waterways invited LVRC to host the report card launch in 2013. Unfortunately due to a clash with the LGAQ conference in Cairns, LVRC was unable to host. However, in a letter to Healthy Waterways, the Mayor confirmed that council remained open to the opportunity to host the launch in 2014. Anne Cleary of Healthy Waterways recently contacted council’s Senior Environmental Planner regarding the opportunity to host the 2014 Report Card launch. Healthy Waterways has provided a generic invitation letter which goes to all Report Card hosts outlining the benefits to and responsibilities of the host organisations. A copy of the runsheet for the 2013 western Report Card launch at Somerset Regional Council is attached for reference. Healthy Waterways has also invited Mayor Steve Jones to speak at the 2014 Report Card launch. The date conflicts with a council meeting, therefore it is proposed that council positions the break of the council meeting to coincide with the launch, to enable the Mayor to speak and councillors to attend the launch. Policy and legal implications will be addressed in future on matters that arise before council. Healthy Waterways will provide $1,000 towards venue hire and catering costs. At this stage the number of attendees is unknown, however approximately 40 people attended the western launch in 2013 at Somerset Regional Council. Hire of the Bauhinia Room at the Cultural Centre and provision of light refreshments for 40 people would cost approximately $700. Therefore there would be no direct cost to council. No further delegations are required to manage the issues raised in this report. The Executive Manager Planning and Development Services will manage the requirements in line with existing delegations. · Healthy Waterways is responsible for all publicity aspects. · The 2014 Report Card cover will be a montage of four images provided by the launch hosts. LVRC will have the opportunity to work with Healthy Waterways in providing a ‘management action’ image for the cover of the 2014 Report Card. This image can profile LVRC’s work in improving local waterways. · In previous years all major TV stations have featured the Report Card launch events. In 2013 there were 180 media clippings recorded across print, radio and online media (this excludes social media). 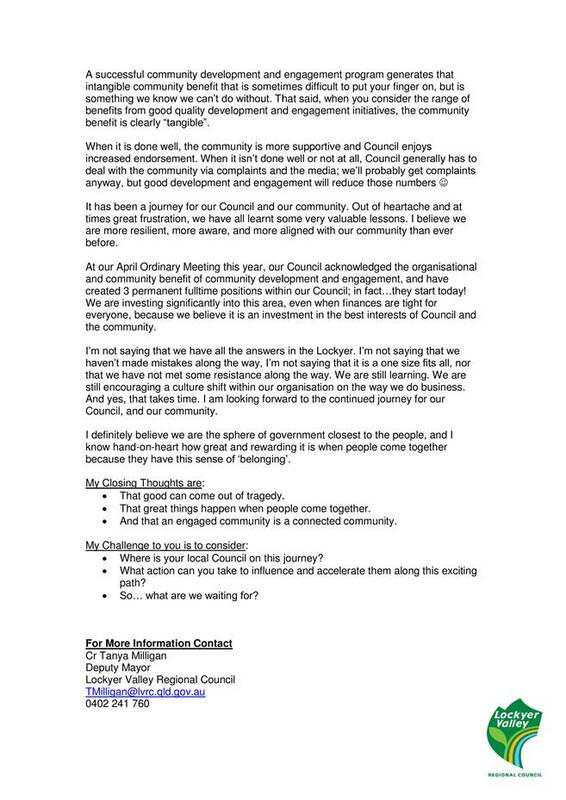 • agree to position the break of the council meeting to coincide with the launch, to enable the Mayor to speak and councillors to attend the launch. This report is to update Council on the emerging matters arising since Council last met in regards to the Infrastructure Works and Services Group. THAT Council receive and note the Executive Manager Infrastructure Works and Services Monthly Update. This report is to provide an update to Council on activities and issues for the Infrastructure Works and Services Group since Council’s last meeting held on 09 July 2014. Previous Infrastructure Works and Services report to Council up to and including 09 July 2014. A current financial summary of the 2011 NDRRA programme follows. · Project Management Office costs incurred after 30 June 14 are not eligible for reimbursement, so this must be minimised. A current financial summary of the 2013 NDRRA programme follows. · Betterment projects have been resubmitted and with a request for funding to be reallocated to other/additional projects. QRA advised that reallocation of funds is not possible for projects that don't proceed. New submissions have been prepared and design is progressing on restoration in the event that the betterment resubmissions aren’t successful. · Thistlethwaite Bridge deck units are now being launched. · Compliance with the Fisheries Act (floodways) requires Development Application and has had time impacts. · New 2013 Betterment projects in the Three Valleys requires acceptance by QRA (and Minister). · ‘Emergent Works’ claim reviewed by the QRA leaves work that at risk of being considered ineligible for funding. · All of 2013 NDRRA program may not be completed by the QRA deadline (30th June 2015) if wet weather of other statutory timeframes emerge. ─ Being executed in conjunction with the Narda Lagoon levee (which is receiving the excavated fill material). · Qld Rail construction work at Blacks Bridge underway. · Discussions ongoing with the State regarding affordability and scope. · Discussions with potentially affected landowners underway. · Road Maintenance Unit delivered 06 August 2014 (funded through 2013-14 budget). · Largely undertaking maintenance activities in parks during winter, including furniture repairs. · Refurbishment of Centenary Gardens at Gatton for the Ageo City delegation visit. · Refurbishment (mulching, tree trimming and irrigation system) of Lions Park at Laidley. · National Tree Day was held at Lake Apex on 27 July. The day was well attended and enabled FOLA to extend plantings in the dry rainforest arboretum. The day was organised in partnership with the Council Environment Team. · Roadworks completed on Walnut Drive Extension except for final two-coat seal (Council capital works programme). · Road maintenance is continuing on routine maintenance in Area 10 (Murphys Creek area). · 2011 NDRRA works by Day Labour crews finished in June 2014. ─ The pavers on the footpaths in Laidley have being straightened up and work completed. THAT Council receive and note the following reports for Council’s information only. Lockyer Valley Regional Council is dedicated to the continuous improvement of Disaster Management through all levels including prevention, preparation, response and recovery. The added teams into the Disaster Management framework will focus on resilience in the community and also be a useful tool in conducting the community engagement framework. This document is for Council’s information only. This report will summarise the activities of Disaster Management team. Disaster Management staff attended the Gatton Show from 8am till 6pm on Friday 18 July 2014 and Saturday 20 July 2014. Disaster Management staff engaged in conversations with show goers regarding emergency preparedness using an interactive map, emergency starter kit giveaway and a children’s spinning wheel game activity to prompt engagement. The Youth Development & Engagement Officer attended all day Saturday. Youth Council also had a presence on site from 10.30am - 5pm assisting Disaster Management with the children’s spinning wheel game and promoting Youth Council. A comprehensive report of both Gatton and Laidley Show involvement follows. Council staff from Disaster Management and Library manned displays at the Ma Ma Creek exhibition using the MERC van and 'Gerrie' the Mobile Library. Waste, Pest Management, Animal Control and Regional Development provided information which was also included in the display. Disaster Management promoted emergency preparedness using interactive tools (displays, emergency starter kit competition and children’s emergency preparedness game) to draw adults and children to the site. The site was well attended by both adults and children. No Council issues were raised and community members were interested in learning more around emergency preparedness. The Manager Disaster Management and Community Engagement attended the Redland City Council “3 Part Exercise Operation Headache” as an observer and evaluator, in addition to facilitating and evaluating the Redland City Council Recovery Phase of the exercise. · Day One was a strategic LDMG phase. LDMG members met and discussed critical infrastructure and priorities of the Group and for the Local Disaster Coordinator to manage. · Day Two Local Disaster Coordination Centre Exercise (Guardian) Evaluation was conducted on information flow, staffing, tasking and Liaison Officer Roles. 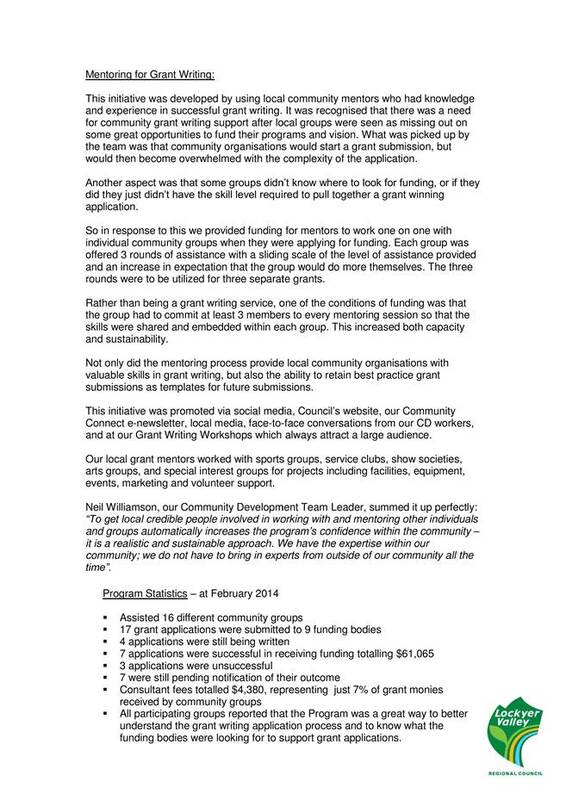 · DLGCRR ‘Get Ready’ Community Resilience Grant Acquittal has been submitted to the funding body. · DLGCRR ‘Flood Warning System – Woodlands Road’ Grant Financial Acquittal and completion report has been submitted to funding body. On Friday the 15 August 2014, representatives from Maldives as part of the AAF funding with QUT will be visiting the Lockyer Valley. The tour will include a presentation by Dave Mazzaferri at the Gatton SES on the 5 C’s of command, control, coordination, communication and cooperation. An SES officer will conduct a presentation on the relationship between community / disaster management structure. The group will visit the new Grantham Estate, Murphys Creek Gauge and Spring Bluff before returning to the Local Disaster Coordination Centre for a Meet and Greet with the Mayor and CEO. This will be an opportunity for participants to share ideas and seek out specific recommendations / suggestions. It will not only be a learning opportunity for the Maldives representatives but a benefit to Council to share their knowledge and perspective as well. The Disaster Management Team have been working with the Area Director of Qld Fire and Emergency Services – Emergency Management to develop the LDMG Exercise Plan. The exercise will be conducted at the next LDMG meeting on 28 August 2014. An initial project scoping meeting was conducted between Disaster Management officers, QFES Area Commander, QFES Manager Fire Safety and QFES-EM Community Engagement Officer for the Get Ready Campaign Launch / Meet Your Local Heroes Day to be held in October. During the meeting partner agencies were determined, potential venues discussed and engagement activities were brainstormed. The project team and Mick Fagan undertook a site inspection on the 24 July 2014 of the Laidley Recreation Reserve and Ferrari Park to assess venue suitability. After consultation with Craig Lashman (QFES), Ferrari Park was determined to be the most suitable site for QFES appliances. Development of the Project Scope Document will follow. Evacuation Centre Management Training was conducted by QFES at the Lockyer Valley Cultural Centre. Seventeen LVRC staff, two QFES representatives and one SES Group Leader participated in the training. · Describe the purpose and function of an evacuation centre. · Understand the requirements for an evacuation centre including resources and equipment. · Understand the roles and responsibilities in an evacuation centre. · Determine the considerations for effective centre management. In partnership with QFES, the Manager Disaster Management conducted Disaster Coordination Centre Training (Modules 1, 3 and 4). This training was held at the Lockyer Valley Cultural Centre on Thursday 3 July 2014. This training is a mandatory requirement for staff who work in the Coordination Centre, and included aspects of information management and flow, positions in the Coordination Centre, briefings and debriefings, Event Action Plans, State Updates and Situation Reports. Twelve Council staff and two QFES representatives participated in the training. Tuesday 1 July 2014, the Lockyer Valley Multi Agency Strategic Bushfire Meeting was held at the Lockyer Valley Cultural Centre with representatives from LVRC, TMR, Roadtek and QFES attending. Discussion was held on bushfire risk areas and strategies to address issues in a coordinated manner between agencies. A number of issues were identified and these locations were included in an itinerary to tour those areas most at risk. A Strategic Multi Agency Bushfire Risk Assessment Tour was conducted on Tuesday 29 July 2014. Officers from Disaster Management and Infrastructure joined with Qld Fire and Emergency Services (QFES) and Transport and Main Roads (TMR) officers in identifying thirteen sites for bushfire risk. Council’s priority consideration is to improve the Fire Trail off Kessling, Drive Laidley to the Rail Line in Laidley, and a controlled burn of a Council road reserve and Queensland Rail land if weather permits. On 27 June 2014 the Woodlands Flood Warning System officially opened. Consultation with flood engineers is still occurring to determine levels for automated triggering of Wig Wags and Road Closed Display. New members are completing the unit of competency – “Participate in a Rescue Operation” - with a goal to have this training completed before the Graduation Evening. Existing members are assisting new members and also completing competency maintenance exercises. An initial project scoping meeting was conducted between LVRC Disaster Management and Lockyer Valley SES for the SES Interoperability Program which is being developed and delivered through NRMA Grant funding. Discussions with Bendigo Bank in relation to the Sandbagging Machine, Boats, and evacuation equipment for Laidley, purchased under a fundraising project for Laidley has seen preliminary discussions determined the equipment is to be gifted to the SES to manage under partnership with Council. Formal documentation to be drafted and signed are still pending due to pending agreements with QR Laidley as to a suitable location site to store the equipment to be utilised for future events in Laidley. This report will summarise Connection! 2014 week hosted by the Attorney-General's Department, Emergency Management Australia division 14-18 July 2014. On the 14-18 July 2014 the Executive Manager Organisational Development and Engagement and the Manager Disaster Management (Recovery & Resilience) & Community Engagement attended the Connection! 2014, held at the Australian Emergency Management Institute (AEMI), Mt Macedon, Victoria. Connection! 2014 was a full program of workshops, forums, masterclasses and expert panels for practitioners. Participants came together over the course of the week to discover, network and discuss cutting edge topics related to strategic foresight and social media in emergency management. Delegates had the opportunity to engage with national and international speakers about how the emergency management landscape is changing dramatically in this world of real-time data and technological advances. The inevitability of disasters and how a change in thinking might change the outcome. · As a society are we really learning, or are we, on some level, in denial (resistance)? The human dimensions of how we lead through uncertainty with wisdom. The need for strategic foresight in government: and why it’s so hard to do. · Why is horizon scanning hard to do? 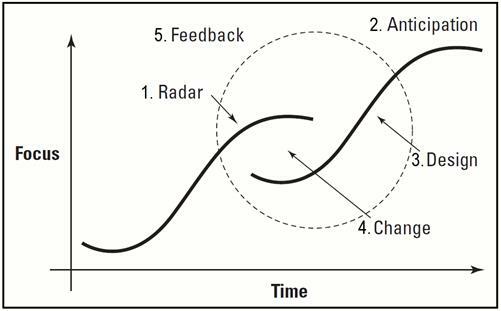 Adapt, innovate and outperform: managing novelty in adversity. · novelty & adversity Why is horizon scanning hard to do? Introduction to the strategic foresight process, its applications and outputs. Masterclass session: setting the scene. Managing information and misinformation in crisis. Community Resilience Australian crawl: Australian public service progress in institutionalising the use of social media. The social evolution within the em sector: where have we come from, the now, the future. Integrating social media into business as usual. Mobilising communities and their potential. Facebook and fire: when the social media admin is also the academic. Facilitation Master Class involving Laurie Kelly from Mindworks Australia in methods to conduct facilitation. Copies of presentations are available for Councillor information. Current committee and taskforce activities for COMSEQ is reported. Lockyer Valley Regional Council is an active member of COMSEQ and this report is intended to provide council with a summary of activity and key matters focusing on the committee and taskforce meetings. For the month of July 2014 there were eight COMSEQ meetings attended by council staff and elected members. The following report outlines the key discussion points from each of those meetings and where appropriate the implications for Lockyer Valley. Highlights of the meeting were a presentation by the A/Director SARA Central Team, DSDIP, on the achievements of SARA during its first year of operation and a presentation by the Regional Manager Greenfields, NBN Co. on the delivery of NBN to new development across South East Queensland. Toowoomba Regional Council reported that for the duration of its incentive policy that reduced infrastructure charges for medium density residential development approximately 900 units were approved at an estimated cost to Council of $9 million in foregone infrastructure charges. Brisbane City Council reported that 4,425 development applications were lodged in 2013/14 which is a 38% increase on the 2012/13 figures. An update was provided on the rationalization of committees and taskforces in line with the new Strategic Plan. It is likely that the new structure will involve 3 or 4 key committees and taskforces will be established to support projects and key outcomes, as required. The new structure for committees is likely to be Infrastructure and Planning, Water and environment and Economic Development. On the Regional Plan members were advised that there is likely to be a longer consultation period of six weeks rather than the usual week for the final stage of the SEQ Regional Plan review. Members noted that the State Government will not be making any substantial changes to the approach; only clear up any contradictions or conflicts. The Taskforce discussed the changes around urban footprints and subdivision in rural areas. It was noted that COMSEQ will brief each Mayor before the next Regional Planning Committee to outline key regional impacts of the plan. The Taskforce discussed the Agriculture Conference. Members of the Taskforce who attended the conference had mixed opinions on its format and effectiveness. Peter Olah advised COMSEQ will send out an email with the presentation links from the conference. The Taskforce discussed Coal Seam Gas (CSG) in the region and agreed that an expert in the field should be invited to a future meeting to further educate members on the pros and cons of CSG. The Taskforce also discussed a regional position on this issue and is of the opinion that even though there may be conflicting opinions from Councils, the issue should not be ignored. Peter advised the Taskforce of the impending changes to the COMSEQ Committees and Taskforces. It was noted that subject to Board approval, the Rural Communities Taskforce will no longer be a standing committee of the board, but will be a roundtable format group where non-urban Councils can discuss regional issues. It was suggested that the CSG issue be recommended as an agenda item for the new group. Members of the Taskforce discussed the effectiveness of the rabbit board and fence in comparison to the amount of money Councils pay for rabbit control. Members also discussed the two separate issues of wild rabbits causing pastoral damage and pet rabbits being purchased either interstate and brought to Queensland, or on the black market. Cr Pahlke advised that Ipswich City Council will be meeting with the Darling Downs – Moreton Bay Rabbit Board in December. Cr Glasheen, who is a member of the Darling Downs – Moreton Bay Rabbit Board suggested Cr Pahlke discuss the issues of control, fines and monetary contributions with the Board at their meeting. Cr Pahlke will provide further comment on this issue after the December meeting. The Committee meeting held on 11 July included a presentation from James Coutts the A/Deputy Director General for Planning (Department State Development and Infrastructure Planning) around upcoming planning reform changes particularly with respect to the new planning legislation titled the “Planning and Development Act”. Core message from James was that the State was targeting a substantial re-write of the legislation. Particular changes to be expected are in how proposals are to be assessed (more flexibility, streamlined and simplified). A second presentation was made by Kylie Williams the Executive Director of Regional Planning (Department State Development and Infrastructure Planning) updating the Committee on progress with the SEQ Regional Plan. Kylie indicated that a draft of the regional plan was currently with the Deputy Premier who was reviewing the document to ensure he was satisfied with its direction. She made a number points concerning the draft regional plan including the potential for further rural residential subdivision if the Council who propose can demonstrate its warrant in addition to further protection for SEQ areas from mining and gas exploration to better protect agriculture and scenic amenity. Once the draft Regional Plan has been endorsed by the Deputy Premier then Councils will be permitted to review and provide feedback through their respective Mayors. Coordinators were updated the on the items in the agenda noting that the COMSEQ office will be moving to a new location mid-August and there will be an official opening function before or after the September Board meeting. It was noted that the current Committee structure is up for review. Peter updated members on the details of the proposed new structure including membership details and meeting schedules. The new Committees will commence from 1 October 2014. Coordinators noted the proposal from Brisbane Marketing for regional involvement in the G20 Global Café concept. A presentation paper has been prepared by Brisbane Marketing for the Board. It was also noted that the DDA roundtable item has been placed on the agenda at the request of the Lord Mayor. The Lord Mayor will lead the discussion on this item at the Board meeting. Steve Kanowski gave an overview of the Inland Rail project including the scope being from Melbourne to the Port of Brisbane. He provided details of work and agreements to date and focussed on the parts of the project from Toowoomba to the Port of Brisbane. Members noted that at this stage, no decision has been made on the route; however a report and decisions are expected by the end of this year. Darren Moore provided a presentation on the ADAC standard (Asset Design As Constructed) which is a way of standardising the provision of information and data for donated assets to Councils. The Committee noted this standard is now part of the SEQ Design code for water entities and is being driven for wide use in Councils. Members were advised that the Board has approved further work on the KPMG study subject to agreed scope and budget. The Committee noted that Council of Mayors (SEQ) have had further discussions with the Department since the announcement of changes including the introduction of the Priority Development Infrastructure (PDI) funding model, regarding opportunities to modify the work already completed in a way that still recognises the value uplift of the KPMG study. At the start of the meeting Peter Olah again noted that mid-August is the likely timeframe for the relocation of the Council of Mayors (SEQ) corporate office to level 12 of the old Suncorp Building. An official opening of the new premises will be planned to coincide with the September meeting of the Board. A welcome was also extended to the City of Gold Coast, who formally resolved to rejoin the Council of Mayors (SEQ). Board members were provided with a presentation on the new, proposed committee and staff structure for COMSEQ. The Board was generally supportive of the proposed structure and agreed that Special Interest Groups will provide an opportunity for interested councils to meet and discuss specific issues. It was agreed that senior council officers would act as advisors to the Committees however voting will be restricted to the Committee members who will be elected officials. As such, meetings will be limited to 24 attendees. There was debate regarding the makeup of the Committees and the likelihood of Mayors being able to attend each meeting. It was agreed that strong Mayoral support is vital however each Council will need to appoint an elected member according to their requirements. COMSEQ confirmed that it is not a requirement that all councils have representation on each Committee but that the structure allows for it. The Chairman noted that communication between Committee Chairs and Council of Mayors (SEQ) officers would be critical to the success of the new structure. Delegations and authorisation from Councils was raised as a concern. It was agreed by the Board that the new structure be allowed to settle in before reviewing the delegations. It was noted that recommendations from Committees can be referred back to the full Board and urgent items can be dealt with via teleconference if necessary. The Lord Mayor welcomed Scott Reid, Regional Manager and Paul Williams, QLD and NT Government Account Manager of CISCO to the meeting. Paul Williams introduced Krishna Prasad Asia Pacific Lead for Cities to give a presentation via Web Conference from India on the trends of social demographics and the emergence of mobile internet and the potential impacts these have on city management. Opportunities were discussed regarding digital infrastructure and the possibilities this can bring to City Infrastructure Management via smart solution architecture (i.e. parking, traffic safety, lighting, waste management and pollution/environment). 2. develop a business case template and investor briefing document and user guide for Councils to use in investment attraction projects. · Language barriers can discourage foreign investors from doing business in SEQ. · Engagement with Federal MPs regarding regional airports. A set of The Business Case Templates for use in populating investment opportunities and a final report from KPMG will be circulated to Member Councils. Council has received an update in July from the Queensland Urban Utilities (QUU) Board which provided highlights from their Board Meeting. · Lockyer Valley Regional Council maintains an ongoing working relationship with QUU on both operational and strategic aspects of water and sewerage provision. · This report is an update on matters of significance with respect to QUU for Council’s attention. · A statutory body, created on 1 July 2010 as a result of Queensland Government changes to the way water is managed in South East Queensland. · Owned by the Brisbane and Ipswich City Councils, and Lockyer Valley, Scenic Rim and Somerset Regional Councils and governed by an independent Board. · Tasked to deliver drinking water, recycled water and sewerage services to the cities and townships within the boundaries of these five local government areas. · Responsible for delivering water to customers, collecting, transporting and treating sewage, as well as charging and billing for water and waste water services for customers in the Brisbane, Ipswich, Lockyer Valley, Scenic Rim and Somerset local authority areas. Queensland Urban Utilities (QUU) has been advised of Council’s resolution rejecting any proposal to transfer billing of Lockyer Valley residents serviced by Toowoomba Regional Council (TRC) to that Council from QUU. In response QUU has committed to work through a solution CEO to CEO which will meet Council’s expectations which will be brought back to Council through a report and recommendation. The Queensland Urban Utilities (QUU) Board held its first ordinary meeting for 2014/15 on 21 July at Scenic Rim Regional Council. As QUU commenced its fourth year of operations, they began operating under the new utility model. Under the new arrangements, QUU are now responsible for the receipt, assessment and approval of water and sewage connections to developers and customers. The new utility model represented significant organisational risk to QUU, however, it was successfully delivered on-time and without disruption to service standards. QUU’s new development services website went live on 1 July, supported by a series of new online forms that streamline and enhance the interaction that developers and customers have with QUU in the lodgement of development applications. The Board met Ian Hall (who recently joined QUU as the Executive Leader Commercial Customers) and his direct reports. Ian is heading up the new group which will manage the customer interface with QUU’s large commercial customers, water reliant customers and developers. This new group has been formed as an outcome of the new business operating model that the Board supported in September 2013. Better servicing these customer segments underscores the Board’s commitment to enhancing and building stronger relationships with commercial and industrial customers and developers. As part of the Target Operating Model review conducted in late 2013, the Board committed to exploring opportunities that would allow QUU to modernise and transform as an organisation. As part of this review, the Board supported the consideration of functions and activities that could be better delivered by the market. On 1 July 2014, QUU commenced operating their first service under this new arrangement with sewer cleaning activities undertaken through a third party contracting arrangement. At the July meeting, the Board supported management engaging with the market to understand opportunities for planned civil maintenance and planned and responsive electrical and mechanical work to be performed under a third party service model. The Board approved the 2014/15 Operational Plan. This plan is prepared in accordance with the requirements of the Participation Agreement and sets out the strategic focus for this financial year. It reflects QUU’s strong commitment to customers and to the delivery of infrastructure which meets the needs of their communities both now and into the future. A copy of the 2014/15 Operational Plan will be provided to shareholders in early August. Earlier this year, the Board endorsed the five year enterprise systems vision, strategy and roadmap. In July, the Board approved a proposal to release to the market a request to form an ICT panel to deliver the 2014/19 strategy and roadmap. The Board considered and approved the placement of the 2014/15 Insurance Program. Whilst QUU suffered significant loss and damage to assets and infrastructure in 2011 and again in 2013 through natural disasters, QUU’s relationship with their insurers has continued to mature with year-on-year reductions achieved in their premiums. QUU have also introduced new innovative arrangements which are resulting in significant savings to their Insurance Program. One such example is QUU’s local fleet repairer arrangement which is supporting regional communities and achieving significant cost savings. The Board operates according to a Board Charter which sets out the Board’s roles and responsibilities and underpins QUU’s governance framework. As part of QUU’s regular review of the arrangements of the Board, QUU have recently reviewed and revised the charter to reflect legislative changes, new Board Committee structures and best practice corporate governance principles. The Board established a sub-committee to provide input into the revision of the charter. The revised Board Charter was supported by the Board. At the May Board meeting, a resolution was passed to declare a total annual participation return equal to 85% of net profit for 2013/14 less any adjustments permitted under the Participation Agreement. This month, the Board acknowledged that formal notification of this participation return will be made by 31 July 2014, with payment of the final participation return by 30 September 2014. The Board noted that QUU has maintained its credit rating with QTC. An A- rating as an entity and AA for QTC debt is a strong result. QUU also retained its A- rating for shareholder debt. These ratings are all higher than QUU’s target credit rating (BBB+ or higher) and is a clear reflection of QUU’s solid financial performance over the past financial year. QTC specifically highlighted that QUU has sound asset management strategies and that the organisation has a strong customer focus with increasing brand recognition. QUU continues to explore opportunities to generate energy and other by-products through the treatment of waste at a number of QUU’s sewage treatment plants. QUU has been working closely with companies that need to discharge out-of-specification products that QUU could use to generate electricity. Pilots exploring the treatment of high strength liquid waste are at advanced stages at Luggage Point Sewage Treatment Plant, as part of QUU’s newly-commissioned Innovation Centre. The Board noted that management is also exploring the viability and feasibility of generating nutrient rich struvite which is a product valued by the agricultural sector. QUU has continued to stand-up a G20 working committee, comprising of key groups across the organisation, in the lead up to this international gathering of world leaders. Relevant QUU employees remain in close contact with leading Federal and State agencies and recent preparedness benchmarking reflects that QUU are in a favourable position compared with other utilities. THAT Council move into Closed Session at 11.19 am to the exclusion of the press and public, in accordance with section 275 (1) (e) & (f) of the Local Government Regulation, 2012, as the matters involves other business for which a public discussion would be likely to prejudice the interests of the local government or someone else, or enable a person to gain a financial advantage and contracts proposed to be made by it. Cr Milligan declared to have a perceived conflict of interest in Item 17.3 “Waste Contract Extension – Anuha Services and JJ Richards & Sons Pty Ltd” and (as defined in section 173 of the Local Government Act 2009) based on her involvement with Anuha Services and dealt with the perceived conflict of interest by leaving the meeting, taking no part in the debate or decision of the matter. In the absence of the Acting Chairperson, Cr Pingel moved and Cr Friend seconded a motion that Cr McDonald assume the Chair of the meeting. THAT Council move into Open Session, the time being 11.41 am. That the above item be considered in Closed Session to the exclusion of the press and public in accordance with Section 275 (1) (f) of the Local Government Regulation, 2012, as the matter involves contracts proposed to be made by it. The report outlines key priority projects for Council’s Waste Management Services Team for the 2014/2015 and seek approval of short term waste services contract extensions of existing contract required to enable the projects to be delivered. THAT Council resolve that the contract with Peace Lutheran Church Inc. (Gatton) (trading as Anuha Services) for the provision of supervision/gatehouse services and Material Recovery Facility (Gatton) management be for a term of twelve (12) months with two options of six months each. THAT Council resolve to negotiate the extension of the JJ Richards & Sons Contract 03/04 -14 for the disposal of waste to Ti-tree landfill for a term of up to two years with options of four (4) six months each. THAT Council resolve to negotiate the extension of the JJ Richards & Sons Contract 03/04 – 01 to provide supervision and operational services for the Laidley site including the use of plant to tamper waste in bins prior to transport to Ti-tree landfill for a term of twelve (12) months with options of two six month periods. THAT Council approve the Chief Executive Officer to negotiate minor variations and price variations should they be raised by the contractor(s). Cr Tanya Milligan returned to the meeting, the time being 11:42 AM and assumed the Chair. That the above item be considered in Closed Session to the exclusion of the press and public in accordance with Section 275 (1) (e) of the Local Government Regulation, 2012, as the matter involves other business for which a public discussion would be likely to prejudice the interests of the local government or someone else, or enable a person to gain a financial advantage. The NDRRA program update is provided to ensure ongoing progress is reported to Council on the restorations works to be completed for the 2011 and 2013 flood event. THAT Council receive the NDRRA Program Monthly Report for the period to 30 June 2014. THAT Council authorise the Chief Executive Officer to establish the necessary funding arrangements with Queensland Reconstruction Authority and Queensland Treasury Corporation to allow Council to manage the ongoing NDRRA Program cash flows to enable the completion of restoration works by the 30 June 2015 funding deadline. The report seeks approval for the construction of a channelised right turn for Spencer Street eastbound traffic heading into the Lockyer Valley Regional Sports and Aquatic Centre to facilitate traffic movements. THAT Council approve the construction of a channelised eastbound right turn for Spencer Street traffic heading into the Gatton Show Grounds to facilitate traffic movements associated with the Regional Sports and Aquatic Centre. THAT Council seek advice from Department of Transport and Main Roads to extend the westbound deceleration lane on Spencer Street (Gatton-Helidon Road) into the Regional Sports and Aquatic Centre Facility. THAT Council seek advice from Department of Transport and Main Roads to replace the westbound solid white line that commences from the intersection of Golf Links Drive on Spencer Street and replace with a broken white line to enable westbound traffic the ability to safely enter the Regional Sports and Aquatic Centre.